Missing teeth are a serious oral health issue, the impact of which affects many parts of your everyday life – such as your appearance and your ability to do simple things, like bite and chew. At Dr. Carr’s dental offices, we focus on helping restore the appearance and function of a healthy smile with dental implants in Hemet and Temecula. 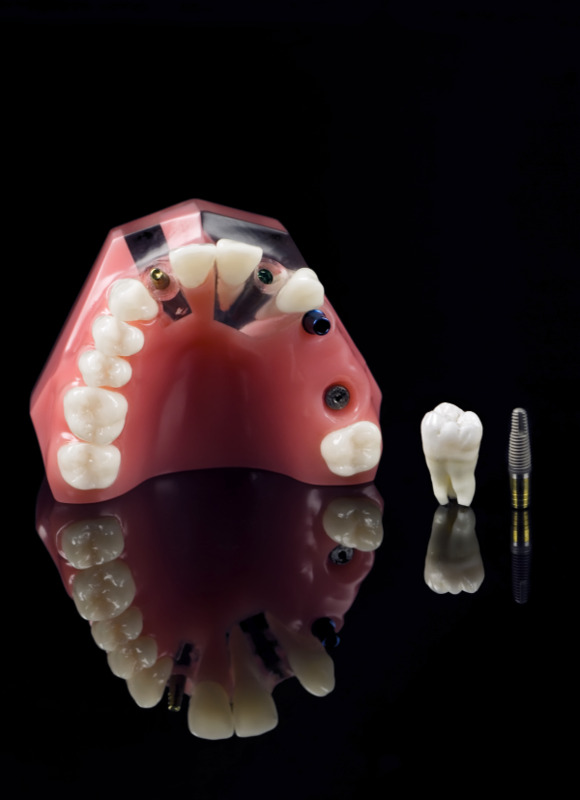 A dental implant is a whole replacement tooth that includes a titanium post, abutment, and a dental crown. The post portion of the implant is placed at the site of the missing tooth and naturally integrates with your jawbone, ensuring stability. Once fully integrated, the post is topped with the abutment and implant crown. The finished result is a completely independent tooth replacement that is permanent and restores full bite function. While you might worry over the cost, after you schedule a consultation with Dr. Byron Carr, you will get a clear idea about the pricing, cost and financing options available to you. • Standard dental implants – Singular dental implants replace only one tooth, and are made with both stability and aesthetic in mind. These implants are ideal for both front and back teeth. • Permanent dentures – Dental implants can also be used as anchors to permanently secure a set of upper or lower dentures. By placing 4-6 dental implants, Dr. Carr can securely affix your dentures to the implant posts, restoring bit function while supporting your oral health. • Implant supported bridges – If you have a small group of missing teeth, Dr. Carr uses a dental implant to secure one or both sides of a fixed dental bridge. This way, he can effectively replace several missing teeth, without needing to remove tooth structure to place crowns that support the bridge. Dr. Carr places your dental implants right in his Temecula and Hemet dental offices – there’s no need to visit an outside specialist to have your treatment completed. With our 3-D treatment planning, we provide patients with guided surgery for precise implant placement. Dental implant treatment is quick and Dr. Carr maximizes patient comfort. Your entire dental implant appointment takes about an hour and, sometimes within a single appointment. Downtime associated with this procedure is usually only 24 hours and we provide patients with dental sedation to help their visit pass easily. Dr. Carr takes a quality-minded approach to implant dentistry, which is why he uses precise treatment planning techniques and ensures that you are healthy before moving forward with implant placement. Get New Teeth Today - Contact Us! Don’t struggle with removable dentures or deal with the hassle of missing teeth for another day. Contact Dr. Carr at either one of his dental offices in Temecula or Hemet to learn more about getting dental implants or implant-supported dentures and bridges. We look forward to giving you the smile you deserve! Please call our Hemet office at (951) 389-0585 or call our Temecula office at (951) 501-3551 if you have any questions.